I just realized that it was one year ago that I started experimenting with watching anime simulcasts, so I figured that this was a pretty good time to look back and reflect on the different ways of watching. At this point, I've watched a fair amount of anime, so I think I should be able to get a fair handle on the issue. Fundamentally, there are two ways that you can watch new shows: you can either watch new episodes week-to-week as they come out, called watching a simulcast; or you can wait for the show to end and watch it all in a couple of days (or even in one sitting), called bingeing. Well, I suppose that you could wait for a show to finish and then watch it very slowly, but where's the fun in that? I guess the real question is, why would you choose to watch a simulcast, or why would you choose to binge watch a show? Obviously there are pros and cons to each method, most of which I've bumped into at one point or another over this year. Let's start with a pro of simulcasts. I would think that the most obvious plus would be that you can stay current. Luckily, over the past several years sites like Crunchyroll and Funimation have really beefed up their simulcasts so that fans can watch subtitled versions of the newest anime, sometimes even the same day that they are released in Japan! This means that there is a free, legal, officially licensed place to watch almost all of the anime that are airing each season. You can almost always find the biggest shows in any case. If you're really desperate, you can definitely find any non-licensed shows being translated by fans on a "fansubbing" site. I don't recommend that though, for a couple of reasons. Partly it's because fansubs tend to be more crass of translations, but my main reason is that the creators and licensees make no money off of fansubs, and can't read any viewing statistics. If you want to support the industry (or just your favourite show), try and stick with official channels. Anyhow, staying current means that you can render spoilers a moot point, and you can understand and participate in any discussions about the latest episode without being confused or feeling left out. It's hard to overstate the importance of being able to discuss things with other people, even if it's something as trivial as the newest development in a show. It really brings you deeper into the experience, and makes you care about what's going to happen in the show. Most anime that I watch, I watch by myself. I don't have a lot of people that I share my hobby with, although occasionally I'll convince a friend to watch a particularly good one with me. That was the case with Robotics;Notes. It aired from October '12 to March '13, and I was really excited about it (what with being the sequel to Steins;Gate). I convinced three of my friends to watch it simulcast with me, so every week, we'd all get together in my room and watch the newest episode on the TV. Gosh that was fun. 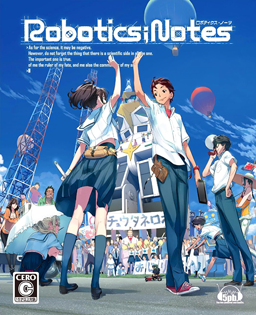 The box art for the game the anime's based on. Robotics;Notes is not the type of show that I would ordinarily think that I would enjoy watching as a simulcast. It's actually very serialized, especially towards the end. Most of the episodes ended with a cliffhanger of some sort, and watching the show one episode at a time didn't seem fast enough. But it wasn't really a problem. The show wasn't actually all that amazing. It was good; well above average, but not amazing. Yet I still remember it as the show that I looked forwards to the most each week, and it was the show that looking back, I had the most fun watching that season. Not because of the show, but because I watched it with my friends. It was a time of community and bonding, and I loved it each and every week. Unfortunately, there's an obvious downside to watching simulcast shows: you don't know what's coming. Thankfully, I've been lucky so far. I've only ever chosen simulcasts that were at least passable in terms of quality. But it wouldn't be that hard to choose one that simply doesn't work. And by quality, I don't just mean what score I would give them afterwards, although that is part. What I'm mostly referring to is whether or not they contain objectionable content in... excessive forms. I'm very careful about what shows I choose to watch. I try not to watch anything with gratuitous fanservice (something that I touch one here). That's why I haven't watched Bakemonogatari and its siblings, as good as I've heard it is. If I want to watch a show, I always check out the score that it's received at animenewsnetwork and at myanimelist to see if it's worth my time, and then I check the stats page and some user reviews at myanimelist, because they're really the only site that tells you the rating (and reason) of each show. Alright, here's a story. I wasn't always as careful about choosing shows as I am now. I was browsing the catalog on Crunchyroll one day, and I came across an anime that looked promising. 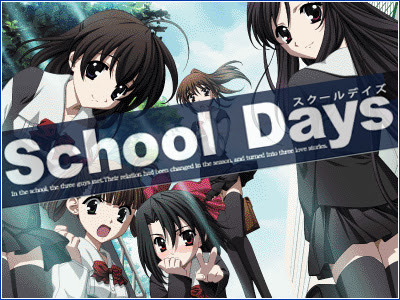 It was called School Days, and it looked like it was a standard high school romance story. I had just watched Clannad, so I was hoping for something of similar quality. I didn't take the time to research it, I just kind of started into it. It looks pretty straightforward and innocent, right? That was by far the worst mistake that I've ever made (related to anime). Thankfully, I realized my mistake fairly early on, and stopped only a few episodes into the series. After I realized what was going on, I stopped watching and went to Wikipedia to see if I was right. The episode summaries proved that I was right. This was not something that was worth my time. Basically, the story is a deconstruction of the Harem genre, where all of the females in the story fall for the main character, and he has to choose one to date. They deconstruct it by showing what would happen if someone tried this in real life - and all the girls had a slight mental instability. Oh, and if the main character was the worst person to ever live, and he tries to date/sleep with all of the girls. It gets messy, it gets dark, you end up hating everybody, and the ending is truly messed up. I had heard that the ending was a bit of a shock, so I skipped to the last episode and watched that. All I can say is... it lived up to the hype. Not worth watching the show for though. So, that's the danger of watching simulcasts. You may accidentally end up watching a show that's as bad as School Days. That's one of the benefits of binge watching a show: you can know exactly what's coming. If it's been out for long enough, you can read what other people thought about it, and you can see if it ended up living up to its promise, or if it just fizzled out in a display of wasted potential. For instance, take Darker Than Black. The first season was great. I think I powered through it in two or three days. However, I've heard nothing good about its second season, so I haven't watched it. I learned my lesson (as opposed to Sword Art Online, where I was warned away from the second half... and didn't listen). On the flip side, look at Kokoro Connect. It (along with Tari Tari) was the first simulcast that I watched. It's not that I regret watching it, but if I had waited and read the reviews about it afterwards, I wouldn't have watched it at all. It wasn't bad per se, but I just don't think that it was worth the time. The main reason that I binge watch some shows is fairly simple: they're just so compelling that I don't want to stop watching them. 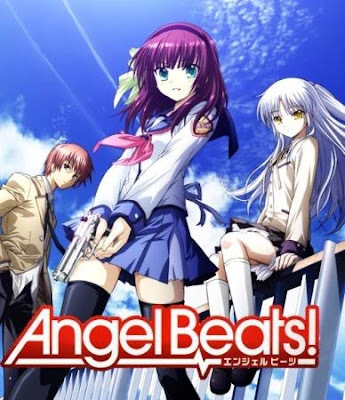 Twice now I've watched the entirety of Angel Beats! in one day. I watched the entire first season of Code Geass in one day. More recently, I watched all of My Teen Romantic Comedy SNAFU in one day, followed shortly thereafter by OreImo Season 1 and OVAs in one day. Once I got into it (and had no internet access), I consumed the remaining 70 or so episodes of Legend of the Galactic Heroes in around two weeks. Why? Because these stories were interesting enough to keep me going. Or, by the time that I realized that they weren't, I just wanted to finish it (*cough* Teen Romantic Comedy *cough*). But for a show like Angel Beats!, it just pulls you in. You care about all of the characters, and you want to see what the Afterlife Battlefront is going to do next in their war against Tenshi... and that's before the mid-series shift! Oh Key and Jun Maeda, I love your stories so much. So, all in all, what have I learned over this past year? Well, first and foremost, I suppose I learned that every show has it's own pace. I watched Tari Tari as a simulcast, and I found that I couldn't remember what had happened in the previous week's episode. It would have been better to binge on that show. I knew that something similar would happen if I tried to simulcast Little Busters!, so I waited a full 6 months to watch it, then binged on it over the course of about a week. Some shows, on the other hand, go perfectly with a weekly break. No matter how hard I tried, I could not get through more than one episode of Serial Experiments Lain at a time. The same is true for Mushi-shi and Natsume's Book of Friends. They're all just so slow paced, you can't keep watching them for long periods. Eventually, you reach the point where you have to stop watching, and just sit there and think about them. Shows in other genres, such as gag shows like Nichijou or the currently airing Kiniro Mosaic are also best taken an episode at a time, just so they don't grow stale. They basically just consist of a bunch of short sketches, so there is no driving plot. It's just rapid fire jokes, which can get a little tiresome if you watch too many episodes in a row. I guess the takeaway from this is to choose your simulcasts carefully. If it's a show that you absolutely have to stay up to date with, or that you want to turn into a watching party with your friends (Attack on Titan anyone? ), then by all means, simulcast it. But if it's a show where you think that having to wait for the next episode would diminish its overall value, you may want to wait and binge on it later. Just remember: always research a show before you start watching it. And never watch School Days. If you learn nothing else from this post, at least know to avoid that show at all costs.